We offer solar training in SketchUp & LayOut using the latest plug-ins such as Skelion. Many organizations teach how to use SketchUp. What sets us apart? We train how to use SketchUp for 3-dimensional modeling of solar systems. We have been doing this type of SketchUp solar training for over 7 years. LayOut is a program that is part of the SketchUp Pro suite. It is used to present the solar SketchUp models in a 2-dimensional world, such as on paper or this web site! Google Earth is a program that we use with SketchUp for working with proposed solar sites and for showing how the completed solar system will look. We use it extensively in our advanced SketchUp courses. Very cool stuff indeed. Skelion is a SketchUp plugin made for the solar industry that we use extensively in our advanced SketchUp courses. Assists in photovoltaic module placement and works in conjunction with PVWatts for predicting performance of solar systems. This is even cooler than Google Earth at least for us solar system designers. 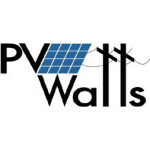 PVWatts is a web based program provided by the National Renewable Energy Laboratory (NREL). We use it extensively in our advanced advanced SketchUp courses along with Skelion and Excel for estimating photovoltaic system performance. Excel is a spreadsheet program that is part of the Microsoft Office suite. We include this in our SketchUp courses for manipulating data obtained from SketchUp & PVWatts when estimating and presenting system performance. Instant Roof is a SketchUp plugin that we occasionally use in our advanced SketchUp courses. Makes a roof as though by magic and trellises too. Contact us today to get training information. *We also offer one-on-one online instruction as well as on site instruction upon request.